Kabul’s population swelled from 1.5 million in 2001 to an estimated 5 million today. Many of Afghanistan's historic landmarks have been restored. Herat's citadel, pictured, was restored by the Aga Khan Foundation. Many of Afghanistan's historic landmarks have been restored. 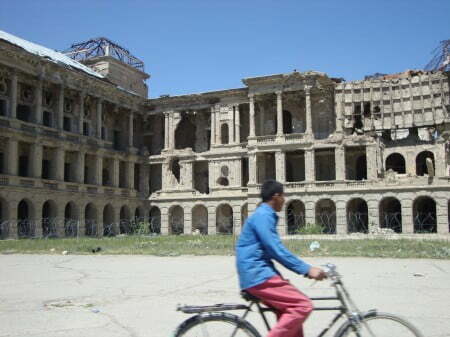 Others, such as Kabul's Darulaman Palce, pictured, still lie in ruins. Taliban attacks in Kabul have become more frequent since 2008. Here, a shopping mall after a suicide bombing in early 2010. The proliferation of weapons among elites is a source of concern for Afghans who suffered through decades of factional violence. The crimes of previous regimes have gone unaddressed since 2001. Here, a man stands in the desert near Pul-i Charki, the site of decades-old mass graves. The crimes of previous regimes have gone unaddressed since 2001. Here, a man stands next to the graves of a family killed by the Taliban in 2001.